This Ne’Qwa art ornament features a snowman having a rootin’, Tootin’ good holiday. Have yourself a good old-fashioned country Christmas with an ornament featuring a snowman cowboy, wearing Western gear including an adorable cowboy hat and a snowflake Bandana. 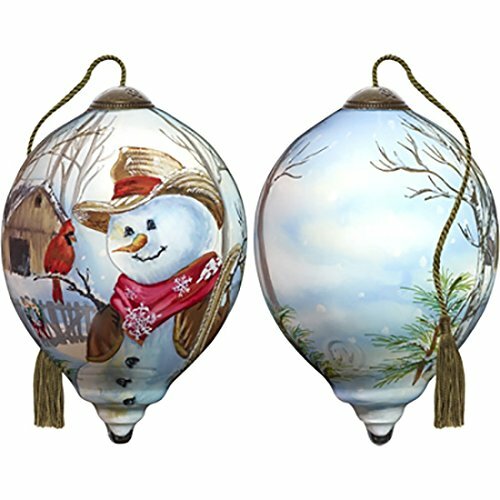 Meticulously crafted by artist Dona Gelsinger and Ne’Qwa art with the centuries-old technique of hand-painting in reverse on the inside of hand-blown glass. Includes a signed certificate of authenticity. Beautifully packaged in a satin-lined keepsake gift box, it makes a memorable Christmas gift for friends, loved ones and anyone with a penchant for Western style. An adjustable tassel cord allows for display on a Christmas tree or a stand. Fits classic petite stand #7000003, walnut finish small stand #7000005 and walnut finish petite stand #7000016. This beautiful Ne’Qwa art ornament is approximately 3 inches high. Petite princess shape.